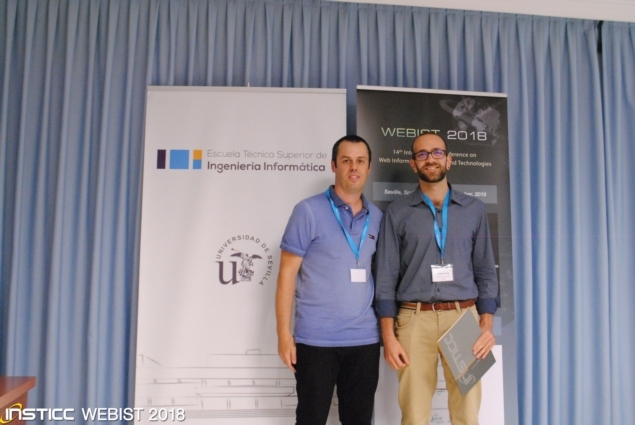 Rizkallah Touma and Anna Queralt, BSC researchers at the Storage Systems group, have been awarded with the Best Student Paper at the 14th International Conference on Web Information Systems and Technologies (WEBIST 2018) hosted by the University of Seville. The paper, titled Machine Learning-based Query Augmentation for SPARQL Endpoints, was elaborated in collaboration with the Ontology Engineering Group (OEG) at the Universidad Politécnica de Madrid (UPM). The paper presents a mechanism to optimize access times to knowledge bases that represent information available on popular websites, such as Wikipedia and IMDB, using Linked Data technologies. The mechanism consists of studying access patterns of users and predicting which information is going to be needed in the future, in order to prepare this information for faster access when it is needed. The approach applies to the Semantic Web field the optimization techniques implemented in the dataClay object store, developed for HPC at the BSC.